The Wivenhoe community archive was officially launched by Baroness Anne Jenkin on 4th April 2015 with Peter Hill, John Stewart, John Foster, John Collins and our MP Bernard Jenkin. 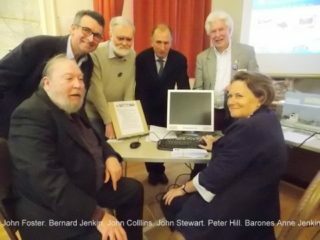 The Wivenhoe History Group was formed 5 five years ago at a meeting held in the Nottage Maritime Institute on 25th April 2013. I had invited about 25 people to this meeting that I knew who were interested in Wivenhoe’s past. It didn’t take long for us to agree that it was a good idea for form a Group to look into Wivenhoe’s history, that is, its recent past as well as its more distant past. Or put another way, Wivenhoe from the Domesday Book to Yesterday, for its history is a;ways being added to. The creation of this web site is just one of the many things we have done in these first 5 years; there is a lot more we can. should and want to do. There are a lot more topics which need to be researched, written up and published. If you would like to be involved in helping to understand a bit more about Wivenhoe’s rich past, how the river strongly influenced Wivenhoe’s character, the people who helped to shape the \Wivenhoe we all all know and value today, please get in touch with me. We need help with transcribing old deeds, cataloguing photographs and recording memories of people who have been familiar with some aspects of Wivenhoe’s history. No special skills or knowledge is required. Time and willingness to help are the key attributes are all we need. Here is a newsletter which describes this 5 year journey we have been on, what we have achieved on this journey and what we are presently working on. This page was added on 19/01/2019.